1. 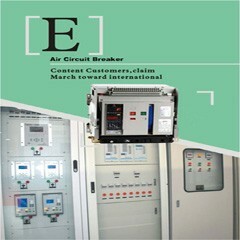 EZC-250F MCCB series is one of breakers which adopts international advanced design, manufacture technology to develop. 2.The rated insulating voltage is 500V, suitable for AC 50Hz(60Hz), rated working voltage 500V or below, rated working current is 15A to 250A of circuit and use in distributing electric energy. 3. It complies with standard of IEC60947-2. The thermodynamic release of the breaker has the advantages of inverse time-delay while the magnetic release the instantaneous operation as shown on table 2(distribution circuit breaker)and table 3(motor protection circuit breaker). [下载没有找到]Meba MCCB Breaker Protection MBS250 is big ampere circuit breaker with high breaking capacity match with RCCB, MCB use to protection power distribution equipment safety.